Review of Earth’s Final Dawn by Clinton E. Taber. 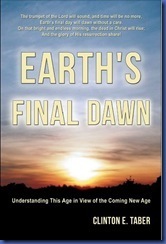 The subtitle of Clint Taber’s new book Earth’s Final Dawn is “understanding this age in view of the coming new age.” It is a systematic eschatology with numerous practical insights. Taber believes that “life has no meaning without destiny” (43). The destiny he envisions is the restoration of Edenic Paradise for eternity, cleansed of all things temporary – like sickness, pain, sin and death. The Bible is the story of how those temporary things came to be, and what God is doing to bring them to an end. It reveals how God has worked through history to replace the temporary kingdoms of Satan and men with his permanent kingdom, ruled by Christ. That kingdom is now in its formation phase – where God is preparing “a people who would live in fellowship with Him in His Kingdom Paradise for His glory forever (xxii). Humanity is on the verge of witnessing earth’s final dawn – the dawn of the age to come. In this present age, Christ dealt with our sin problem by becoming our sacrifice of atonement. In the new age, after Christ returns, he will destroy death by raising his own from their graves, and destroy all his enemies by consuming them with the fires of hell. All of this is immanent – it could happen at any moment. All of this is necessary – because God’s plan for a restored Edenic Paradise cannot happen without it. In Taber’s explanation of these things, you will find exegetical overviews of significant eschatological books of the Bible (like Daniel and Revelation) and extensive treatments of relevant doctrines (like the resurrection, the timing of the second coming, and conditional immortality). His treatments are thorough, biblically sound, and up-to-date. He avoids following the party-line of popular end-times teachings, but points out that their popularity is due to the relevance that eschatology has for everyone. Taber is not an extremist. He encourages balanced, biblical thinking on these important issues. He discourages the kind of date-setting fanaticism that has brought shame to the Church historically, and recently. He presents a powerful case that Christ could come in this generation, but stops short of saying that he definitely will. His evidence is compelling to anyone, but especially to those of us who long for our coming king. Taber goes beyond simply proving that Christ is coming again. He gives his readers an appetite for the event. His descriptions of “main street” and “paradise park” (chapter 7) paint emotionally charged portraits of why Christ must come back. He captures the angst of this age with his descriptions of the pain, anxiety, trouble and sorrow that this world is now facing. He offers glimpses of a new age where the old limitations and sorrows are erased – the old bondages destroyed. He speaks as a man, and as a man of God who has seen much suffering, but who still believes that “God will not leave man forever in a world that falls short of his glory and purpose” (247). Tabor neither expects nor demands complete agreement with everything he has presented. He encourages investigation. I took exception with Taber’s treatment of Rev. 20, and of some of his exegesis of Matthew 24. But these minor differences of exegesis did not deter me from my enjoyment of the work, or my benefit from it. Taber’s work is a well-written reminder that the second coming of Christ is the believer’s blessed hope. Come, Lord Jesus. Clinton E. Taber, Earth’s Final Dawn (Xulon Press, 2011) hereafter referred to by page number or chapter. Conditionalists will find particular interest in chapter 2, where Taber shows that Christ was sent to fight the battle of the ages in his own grave (63). Taber points out that “Death is the antithesis of life. Contrary to popular opinion, it is not the same as life. Death prevents man (even a believer) from experiencing the glories of God’s Kingdom Paradise. Without resurrection, there isn’t any future for man” (64). In chapter 5, Taber argues against the notion of innate immortality and for the notion of humanity’s complete dependence upon God. He investigates three views of what happens at death (reincarnation, relocation and resurrection) and concludes that “our problem with death stems from the fact that we were created for something better” (157). In chapter 6, Taber explains why the adjective eternal describes both destinies: “Eternal death is death forever. Eternal life is life forever” (193). This entry was posted in article, article-archive. Bookmark the permalink.